Lee Harlin Bahan delves into the crowded field of Petrarch translations and delivers a classical offering with a postmodern-cool facelift. A Year of Mourning is daring, quirky, and playful, but with traditional trimmings. The expected classical and Biblical references abound, but also vivid allusions to pop culture and the contemporary social scene, including Madonna, Robert Frost, rock ‘n’ roll, even the Walnettos caramel-walnut candy. This is the Petrarch you know alongside the Petrarch you’ve never experienced before. This is a Petrarch translation not to be missed. Lee Bahan has undertaken a seemingly Herculean task, to translate a group of Petrarch’s sonnets while eliminating almost everything we associate with the word “Petrarchan”; it’s as if her template is a cross between Shakespeare’s “My mistress’ eyes are nothing like the sun” sonnet, and the lyrics of a particularly annoyed and upset country singer. This is emphatically not our grandmother’s Petrarch, but it is by turns startling, engaging, surprising, beguiling and occasionally annoying . . . paradoxically enough, not unlike the originals. If this is old wine, it’s being served from a winningly flamboyant new bottle. What if that lovelorn Italian sonneteer Francesco Petrarca was a wisecracking guy named Frank Petrarch from Indiana who fell in love with his neighbor’s wife, Laura, and then turned to poetry in sorrow when she died young of an infectious disease? The result might be something like Lee Harlin Bahan’s translations and transformations in this sonnet sequence. Here, the corset tightened until the bones crack has been loosened to allow for a natural diction, syntax, and idiom that allows that old ghost, Petrarch, to speak to us as if he were alive today. The loosened but elegant meter and occasional harmonic rhymes pay homage to the form, but the real interest here is in reflecting Petrarch’s stark emotion structured into wit and rhetorical play. The result is readable, rewarding, and exciting. This is one that belongs on your nightstand. 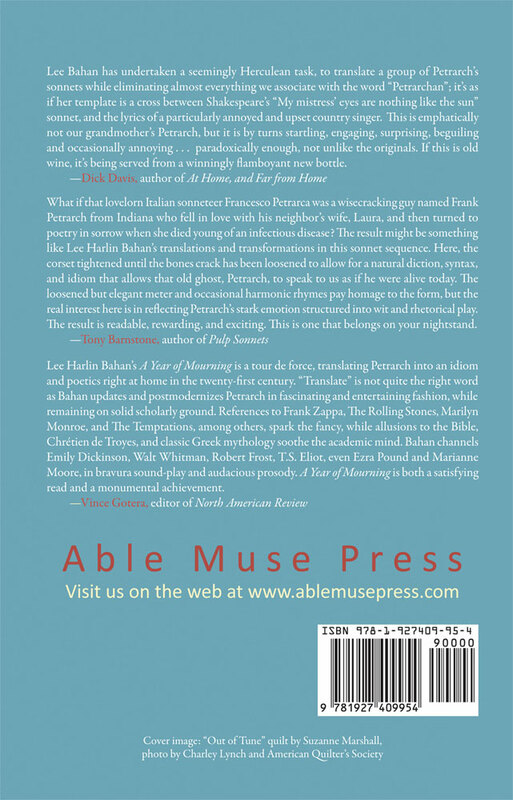 Lee Harlin Bahan’s A Year of Mourning is a tour de force, translating Petrarch into an idiom and poetics right at home in the twenty-first century. 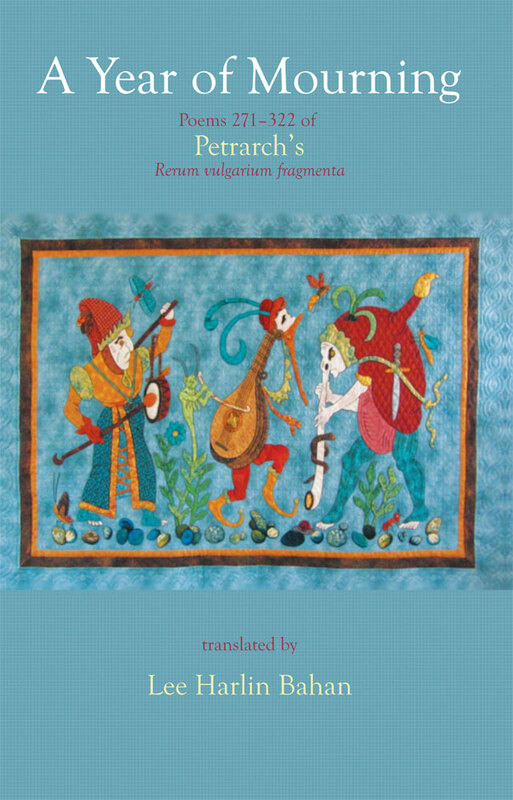 “Translate” is not quite the right word as Bahan updates and postmodernizes Petrarch in fascinating and entertaining fashion, while remaining on solid scholarly ground. References to Frank Zappa, The Rolling Stones, Marilyn Monroe, and The Temptations, among others, spark the fancy, while allusions to the Bible, Chrétien de Troyes, and classic Greek mythology soothe the academic mind. Bahan channels Emily Dickinson, Walt Whitman, Robert Frost, T.S. Eliot, even Ezra Pound and Marianne Moore, in bravura sound-play and audacious prosody. A Year of Mourning is both a satisfying read and a monumental achievement. Lee Harlin Bahan earned her MFA at Indiana University-Bloomington. Her thesis, Migration Solo, won the first Indiana Poetry Chapbook Contest. Her second chapbook is Notes to Sing. Bahan’s own poetry has appeared in Ploughshares, The Kenyon Review, and The North American Review, and her translations have appeared in Natural Bridge, Southern Humanities Review, and Flying Island. After receiving a local grant to study Italian, Lee enjoyed a month-long residency at Mary Anderson Center for the Arts, Mt. St. Francis, IN, pursuing her goal of translating Petrarch’s sonnets. Bahan lives with her husband Pat in a hundred-year-old farmhouse outside Medora, IN. A Year of Mourning was a special honoree for the 2016 Able Muse Book Award.